Reserve your tour at Redwood Hill Farm, we look forward to meeting you! You’re invited to join us on the farm this spring. We offer several types of tours for you to choose from: our Full Farm Tour, a Kid Cuddle Day or personalized Private Tour. Our Full Farm Tour day begins at 11:00 am and lasts until 2:00 pm, with a guided tour of the farm by one of our family members. Learn about the farm history, the sustainable practices we use, and enjoy viewing and learning about the flower field, fruit orchards and organic vegetable garden. Of course this tour includes plenty of time with our dairy goat herd including cuddle time with the new baby goat kids. You will also have a chance to learn how to milk a goat if you’d like! 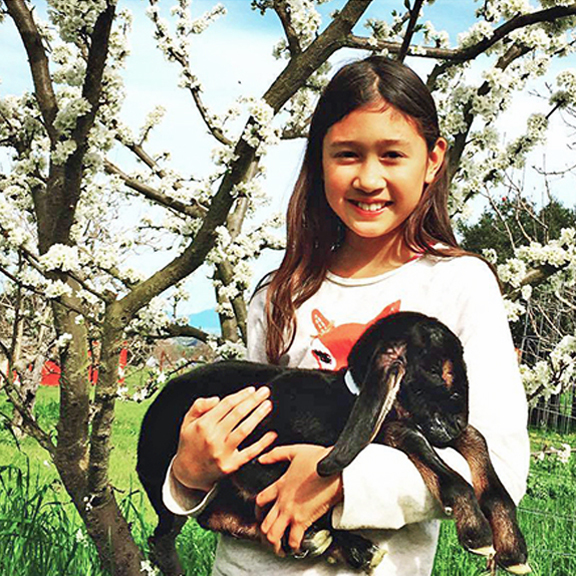 We know the goats are the real “stars” of our tours, so if your focus is to simply enjoy the baby kids while relaxing on our west Sonoma County Farm, join us for one of our scheduled Kid Cuddle Days, also from 11:00 – 2:00 pm. You’ll learn about our life with goats, have the opportunity to ask us lots of questions and just enjoy cuddling and being up close and personal with the newest additions to our herd. This tour focus is the baby kids and does not include the guided tour of our farm. Our personalized Private Tours of the farm are arranged to your schedule (dependent on our availability) beginning in the month of April. Tour cost is $120 for up to four persons with an additional cost for extra adults and/or children. Please call at least 24 hours in advance to schedule your tour: 707-827-3366. Upon arrival, please park where signs indicate is the parking area and proceed to our Farm Market Stand to check-in. Bring a picnic to enjoy in the orchard if you’d like! At the Farm Market Stand we will have available for purchase award-winning Redwood Hill Farm goat cheese, seasonal fruit and fresh flowers, as well as skin-nourishing goat milk soap made with our fresh goat milk and Capracopia Olive Oil that we produce on the farm. You may wish to bring a cooler and ice if you’d like to purchase cheese and produce to bring home. We will also have available for purchase organic cotton market bags and our new anniversary logo tee-shirts as souvenirs from your farm visit. Please, no pets are allowed on the farm. Thank you for understanding. CLICK HERE to download a PDF file with directions to the farm. Spring is the perfect time to visit the farm and we are looking forward to meeting you this year! Please fill out all information below. Then, select the submit button for reserving your tour and making payment via PayPal. A farm staff member will contact you to confirm your tour date. Note: Please check our Visit The Farm page before departure. If farm conditions are excessively muddy or heavy rain is expected, your tour will be canceled and rescheduled. In the event of cancellation, we will contact you in advance to reschedule your tour. $5 per child, children under 5 are free. Please plan to wear clothes and shoes you won’t mind getting a little “farmy” as you’ll have an opportunity to get up close and personal with our goats in the barns, learn to milk a goat, and explore our orchards and gardens. If you cannot make it on your scheduled date for any reason, please provide us at least 72 hours notice so that someone else can enjoy coming to the farm on that day. We will reschedule your date or send you a refund. Unfortunately, we cannot refund less than 48 hours notice. Any additional information you would like to share with us before your tour? Please contact us at capracopia1@gmail.com with any questions. Thanks for booking your farm tour, we look forward to meeting you at the farm! you will receive a confirmation notice when PayPal payment is processed.